On November 2nd, 2001 our daughter Sarah Elizabeth was born. Tragically, she passed from this life eight hours later, after midnight on November 3rd. These two days have been rough for me ever since that time. John Piper once compared grief over the death of a child to an amputation. Unlike a gunshot wound, once the healing is done, the arm is still missing. Then follows the feelings of loss over what might have been and dealing with the gone-ness that will never be resolved this side of eternity. On question that comes up occasionally is that of what happens to infants when they die. I am completely sure that God saves them and takes them to heaven, but what do I base that on from Scripture? Glad you asked. It is not that infants are not fallen along with Adam like the rest of mankind. They are. Romans chapter 5 makes that abundantly clear. It is, however, a matter of accountability before God. I would begin with what jesus said to the Pharisees in John 9:41. The culpability is based on their ability to see what jesus taught, but rejecting it. Because they had been exposed to the truth and rejected it, the were still in their sins. 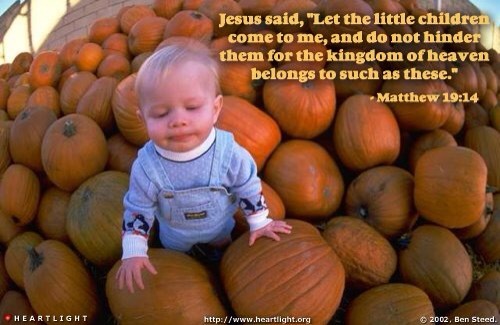 Infants cannot perceive the message and have no sin in this regard. But what about those who have never had the Gospel preached to them? Paul addresses that question in Romans 1:19-20 and it directly pertains to what we are speaking about here. What is of necessity implied here, is not only that those who have not formally heard about God have no excuse because of how God has revealed Himself in the natural world, but that those who are incapable of reasoning and observing creation DO have an excuse! This would mean not only small children, but also those with mental capacities so severely diminished that they are unable to perceive God in creation. So based on those Scriptures, along with others, I would tell parents who have lost a child that they will see that child again, and that their loss is not an eternal one. Of course that assumes that the parents are believers, too so that they can be in heaven as well. God is able to cover those who have an excuse due to early age or mental capacity due to His mercy, and the shed blood of Jesus for sin. In the end, what was written in Psalm 119:68 will still be true of God.